(Clearwisdom.net) Seven Falun Gong practitioners will file a genocide lawsuit in Taiwan's High Court on November 17, 2003 against former Chinese president Jiang Zemin, former premier of State Department Li Lanqing, and Chinese Communist Party Politburo member Luo Gan. On November 15, more than 10,000 Falun Gong practitioners held a rally in front of the Presidential Office in downtown Taipei to support the legal action. The media gave extensive coverage of this. According to AP report on November 13, Taiwan Falun Gong practitioners planned to file a lawsuit against former Chinese president Jiang for persecuting Falun Gong and aiming to wipe out this popular spiritual movement in China. Over the past two years, Falun Gong practitioners around the world have filed at least a dozen lawsuits in foreign courts against Jiang and other Chinese officials for violating human rights. They alleged that Jiang, as head of the Chinese Communist Party was responsible for the persecution. Taiwanese people have frequently rendered their support for Falun Gong practitioners who have been imprisoned in Mainland China. VOA reported on November 15: Taiwan Falun Gong practitioners will file a lawsuit against former Chinese President Jiang with Taiwan's judiciary system for persecuting human rights. More than 10,000 Falun Gong practitioners gathered on Saturday in front of the Presidential Office to practice the exercises and sitting meditation to support seven Falun Gong practitioners who will file a genocide lawsuit in Taiwan's High Court against former Chinese President Jiang Zemin and former Premier of the State Department Li Lanqing and the Chinese Communist Party Politburo member Luo Gan. The report said, Taiwan Falun Dafa Association President Chang Ching-hsi read a public statement entitled, "Bring Jiang to Justice, Taiwan Files a Lawsuit." He said, "In the past four years, Taiwan Falun Dafa practitioners have been subjected to illegal detention, suffering, violence and other persecution during their visits to China. They traveled to Hong Kong and Iceland to participate in legal activities, but were unreasonably repatriated, detained or suffered damage on their property and physical safety." Chang Ching-hsi pointed out that Falun Gong has no political motivation, and practitioners seek no political benefits. The practitioners only hope to safeguard humanity's basic freedom of belief, freedom of expression through judiciary system, and hope to uphold basic value of human rights, righteousness and kindness through a just trial. BBC reported on November 15: nearly 10,000 Falun Gong practitioners performed the exercises and sitting mediation in front of the Presidential Office to protest the Mainland authorities' persecution of Falun Gong and call for an immediate release of four detained Taiwanese practitioners. The report said, "'Stop persecuting human beings, and safeguarding basic human rights' is the theme of this rally. They hope the Mainland authorities stop persecuting Falun Gong. Besides the activities on Saturday, Taiwan Falun Dafa Association has launched a bicycle tour around the island entitled, 'Stop persecuting human rights, let Falun Gong practitioners go home.' Dozens of Taiwan Falun Gong practitioners in two teams rode bicycles to travel to counties and cities in Taiwan to promote their principles and seek support. Many local people rendered their support, including heads of towns and county councilors." Taiwan Falun Dafa Association pointed out that currently four "Mainland Brides" had been arrested when they visited their families in their hometown in the Mainland and could not return to Taiwan. Taiwan Falun Gong practitioners called upon the Mainland authorities to respect human rights, and release "Taiwan's daughters-in-law" immediately. 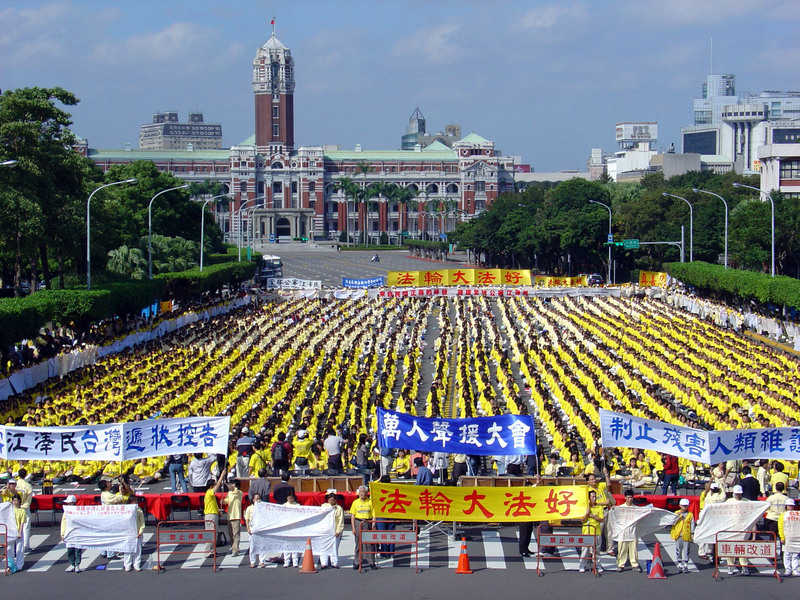 Central News Agency reported on November 15: Taiwan Falun Dafa Association held a 10,000 practitioners' rally to support a lawsuit filed by seven Taiwan Falun Gong practitioners against Jiang. On November 17, the seven practitioners would file a lawsuit in Taiwan's High Court against former Chinese president Jiang Zemin, former vice premier of State Department Li Lanqing and Chinese Communist Party politburo member Luo Gan for violating Statute Against Crime of Genocide. Taiwan Public TV Station reported on November 14, the Mainland China persecutes Falun Gong practitioners disregarding their nationalities. Seven Taiwan Falun Gong practitioners who used to be illegally arrested in China, with the help of their lawyer, will file a lawsuit next Monday against former Chinese president Jiang Zemin and others for crime of genocide. This is a rare lawsuit based on International Human Rights Convention in Taiwan. Radio Free Asia November 15 news in Taipei: more than 4,000 Falun Gong practitioners held a sit-in and practiced the exercises on Saturday in Taipei to protest the Mainland China's persecution of Falun Gong. Words on banners these practitioners held expressed their request to bring former Chinese president Jiang Zemin to justice. The report said Falun Gong practitioner Lin Hsiao-kai who was detained in Mainland China for 20 days and six other Taiwan Falun Gong practitioners who used to be detained in Mainland China would file a lawsuit in Taiwan's High Court against former Chinese president Jiang Zemin, former premier of State Department Li Lanqing, Chinese Communist Party Politburo member Luo Gan for crime of genocide. The World Daily reported on November 15: nearly 10,000 Taiwan Falun Gong practitioners and representatives from different countries gathered in front of the Presidential Office, condemned former Chinese president Jiang Zemin as "Scoundrel of Human Rights," and published a statement entitled, "Scoundrel of human rights should be held accountable," to support Falun Gong practitioners suffering persecution in Mainland China. The report said, Taiwan Falun Dafa Association President Chang Ching-hsi thought that former Chinese president Jiang Zemin has branded Falun Gong as illegal in the past four years out of his own jealousy, and taken Falun Gong as a target of political struggle. Jiang has not only deprived the Chinese people's freedom of belief, but also extended the persecution overseas. Amnesty International has listed Jiang Zemin as "Scoundrel of Human Rights" in 2001. Up to now, governments of different countries have made more than 130 statements to condemn Mainland China's act. Since last October, in the US, Belgium, Spain and other countries, Falun Gong practitioners have filed lawsuits against Jiang Zemin for his crime of genocide, torture and anti-humanity. Chang Ching-hsi hoped that Taiwan's court can give a fair inquisition, and people can also made a fair trial in the court of their conscience.